Summer internship programmes are significant career milestones. Every year young people from all over the world try hard to get into their dream internship programmes. Summer Internship programmes are usually eight to twelve weeks long. Taking a summer internship programme can be helpful in gaining an edge over your future competitions in the job market. It will boost your employability and you will gain valuable real-world experience. 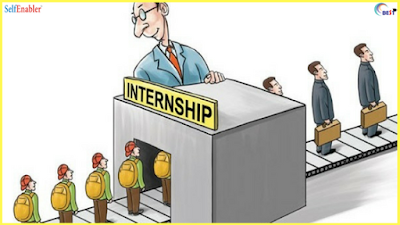 Summer internships programmes are the most popular among students as they can join the internship during summers. These internships provide a first-hand real experience to the student of the professional world. They can wind their knowledge to action. Here they get a chance to know if they still want to continue their current career option or want to take a different path. Interns can gain professional skills without actually getting into the pressure of a full-time job. Apart from this, Summer Internship Programmes provide a chance to the interns to make new and important connections. By attending events and meetings they come in contact with important and resourceful people. It can all be really helpful during the initial stages of developing a career. Also, summer internships train you on the skill of Time management. It is very important in the fast pace of professional environment. Technology. During your Summer Internship Programme 2018, you will learn new skills and reach out for best possible opportunities by working with their expert crew of Java/Android/IOS developer. You are given an opportunity to learn and a working experience with the experts. Human Resource. 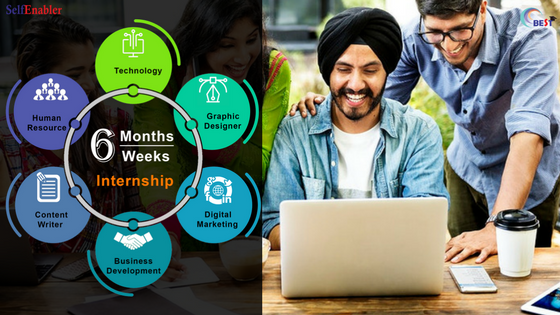 Internships at Talent4Assure are structured as learning experiences that combine in-class theory with world class application. Content Writer. At Talent4Assure you are given an opportunity to indulge in extreme levels of creativity and present high-end content. You can redefine and produce content that targets the right audience. Business Development. During the Internship programme, you will be trained in the development of employer’s products and services, creation of marketing strategies, generating sales leads, negotiating and closing deals. Digital marketing. During your Internship programme, you will have the opportunity to learn many new things. You will see how an agency operates, how departments interact to get a project completed and how digital platform is used to increase the reach of a company. Graphic Designer. Whether you are interested in web design, advertising, or even designing packages for consumer products, there are always firms seeking great graphic design talent. Working at Talent4Assure can involve everything from designing to redesigning websites, working on major ad campaigns (design, layout, photo editing, etc) and much more. What are you getting from Summer Internship Programme 2018? 1. Talent4Assure is an organization where you will be working with professionals. They will help you in developing not only your personality but help you understand yourself. Here you will be hired and then trained. 2. Here you are skilled to produce innovative driven solutions. It is a big step while considering Entrepreneurship. 3. While working with the professional and skilled experts, you get to experience the gap of ordinary to extraordinary. 4. Talent4Assure provides a wide range of profiles. Invest your time by choosing from this wide range of options. 1. The environment at the Summer Internship programme is friendly and disciplined. The employees are constantly motivated by their employers. 2. Both personal and professional development is given importance. 3. Apart from professional events, various cultural and fun activities help every weekend and on special occasions. 4. To encourage interns for a better performance rewarding work environment is followed. 5. To make interns feel at ease, a comfortable workspace is provided. 1. Summer Internship Programme can widen your horizon of knowledge and polish your technical skills. 2. During this programme, you will be handling your own client. This will enhance your business insights. 3. By working independently on your projects, you will get a chance to improvise your designing, writing and creative skills. 4. The key benefit of becoming an intern at the summer internship programme 2018 is to improve your skills. 5. The Summer Internship Programme 2018 at Talent4Assure gives you high career opportunities with insightful reviews. Internships are great tools to improve your chances as a job applicant and help make you a better potential employee. The summer internship programme 2018 helps you to build your confidence. The internships help you to get all ready to go on that interview. It gives you the skills, the experience, the desire, and the confidence to make it all happen. Bottom line? The options are limitless. You just need to have direction and drive. Enroll in one of the Summer Internship programme 2018 to raise the chances of getting a job of your dreams. Transitioning from college to career can be intimidating. Many young graduates often lose track of which career path to take in this competitive job market. Today, companies prefer hiring employees with experience. Fresh college graduates with no experience find it all the more difficult to get the job even if they are eligible for it. Internships are formal programs within organizations whose main purpose is to offer first-hand practical work experience in a particular occupation to those who are new in it. An internship can be paid, for credit, unpaid or not-for-credit. Whether it is paid or unpaid, credit or not-for-credit, it does not decrease in value. These are investments in your future. Many students feel reluctant to take internships as let's be honest; no one likes to work for free. The truth is, although they might not be getting cash but might be getting paid in other ways. Here is a list of reasons why taking up an internship can help you in a future career. An internship provides you with real-life experience and exposure. There is a huge difference between learning about strategies and tactics and actually applying them. The internship allows students to gain first-hand exposure to working in the real world. It also lets you harness the skills, knowledge, and theoretical practice that you learnt back in university. An intern is given a proper training, assignment, and duties without the added pressure. The best part is an intern gets to learn about the specific industries and companies they are interested in. · The opportunity to understand more about yourself. This means you will get to know and understand more about your goals and how you can achieve them. By taking up an internship you get a chance to explore what a career in a particular occupation has in store for you. Sometimes, reality does not meet expectations. At this point, a student can make a decision if they still wish to continue or change the career path. It ‘s best to know as early as possible, and an internship can help you do that. · Networking. Making professional connections is a very crucial part of getting started on your career path. During your internship, it is very important to make as many connections as you can. Take an interest in who are you working with. Simple greetings Like “Hello, How are you?” or “Goodbye, take Care” can help you make those everlasting impressions. If you perform well in your internship your employer might just give you a letter of recommendation or introduce you to other important and influential people. · Improve your Resume. Your resume is a record of all your accomplishments, talent and experience. If you don't have what the employers are looking for you don't have a chance of getting hired. There is one specific section on your resume that employers are most interested in. Experience! Internships are the perfect way to improve and enhance that resume of yours. It makes a very good impression when your employer sees that you have completed an internship over the summer, for a hefty six-month span, or even abroad. It will be quite convincing to them that you can prove to be an asset to their company. List the tasks you have and projects in which you participated in to demonstrate your value. The more experience you acquire, the better are the chances of success in your career path. · Time management. During internship one thing you learn and master is time management. In such a fast-paced professional environment you need to know that every second count. Time management is one of the most important skills you can learn during internships. Deadlines are important. You might not be able to meet all of them but you do learn valuable professional lessons that you will carry with you throughout your career. · Career foundation. Many employers use internships as a recruitment tool. In many cases, companies hire interns after graduation. Internships are great tools to improve your chances as a job applicant and help make you better and potential employee. Therefore, it is very important that you choose your internship based on your interests and career prospects. · Initiative. What did you do when there was a problem? If you made any good and valuable suggestions about how things could be improved, these will show you as a good self-starter. If your ideas were put in a place and worked out well, it’ll give a good boost. According to a survey conducted by National Association of Colleges and Employers (NACE), about 63% of the graduating class took part in an internship. The word is out, and internships are almost essential nowadays in order to get a job. Be a part of an internship to understand its objectives and benefits. Wind your knowledge into action. The biggest dilemma an individual faces who is fresh out of college is where to look for jobs? Campus placements hold great importance for students because of this very fact that finding jobs for fresher in Delhi NCR is an extremely tough task. Delhi, being a metropolitan city has a lot of employment opportunities however, for each vacancy in a firm, there are thousands of resumes waiting to be reviewed. It is very easy for your individuality to get lost in a crowd of resumes. The other option of walk-in interviews is also a common practice among fresher looking for jobs. However, these occur once in weeks with several candidates lined up to try their luck. In such a scenario, the only option left for you to be able to land a job is to contact your friends, relatives, and acquaintances to forward your resumes to the HR in companies they work in. But, even this practice doesn’t assure an employment opportunity. It can be disappointing to find yourself unemployed after the completion of your graduation, nevertheless, there are ways by which you can help yourself land a job within a few months. 1. The first step towards searching for a job requires you to be full assured about the job profile you are looking for. An individual with HR background shouldn’t be applying for BD fresher jobs. Once you have decided this, start looking for companies looking for that particular profile. 2. If you are unaware of the industry you want to step in, do a thorough survey of the market for new and lucrative job options. It is not necessary to only opt for conventional jobs, which you know pays well. With the advancement in technologies and introduction of newer marketing and business strategies, several new job profiles have come into existence. 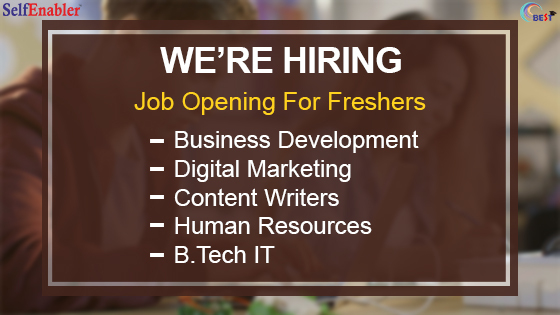 Many Digital Marketing fresher jobs have come up with the growth of social media and its use for business networking. Companies have also started posting for Content Writer fresher jobs to meet the growing need for content writers to supply with continuous online content. 3. Make a resume. You just cannot find a job without a resume containing all your relevant details. It is required to approach people having the power to give you a job. You can find a sample resume online which you can model as your own. Make sure to add all the academic and curricular details which are relevant the position you are applying for. For example, a person applying for HR fresher jobs should include relevant details of his ability to maintain interpersonal relationships and social relationships. 4. Make use of job portals to apply for jobs. Create an account on these portals and upload your resume. These portals serve as very beneficial as they help in overcoming geographical limitation. A candidate sitting in Delhi, looking for B.tech IT fresher jobs, can easily apply in companies situated in Bengaluru, the IT hub of India. You can apply for jobs in many companies at the same time and can narrow down your search using specific keywords based on the job you are looking for. 5. If possible, get training in relevant skills in your field. It will help you gain an edge over other competitors competing for the same job as you. Companies prefer employees whom they don’t have to train and who are well-versed with their subject before-hand. As a fresher looking for Digital Marketing fresher jobs, a training course in Digital Marketing will assert you as a trained professional in front of your interviewer. There are several organizations and firms which offer jobs and training to people who are freshly out of college. It is always advisable to take up your initial jobs in companies which not only provide you with a stable paycheck but also present you with enough exposure for you to hone our skills and develop a deep understanding of your industry, equipping you with knowledge to deal with adverse situations. One such firm is Tallent4Assure which offer jobs for freshers in Delhi NCR. The firm offers 100% placement to individuals looking for job as a developer, content writer, and graphic designer or in HR, Digital Marketing, and Business Development. You are first hired and then trained to perform your respective tasks. The firm is focused towards building quality resources by equipping them with skills and providing them with real-time industrial exposure under professional and experienced guidance. They offer you the freedom to choose from a range of profiles that best suit your interests and aptitude. You can also be assured of a warm work environment with disciplined and motivated group of employees. They also organize cultural and fun activities to engage employees and grow a sense of belonging among each other on weekends an on special occasions. Be assured to be rewarded for your hard work which results in an overall personal and professional growth.